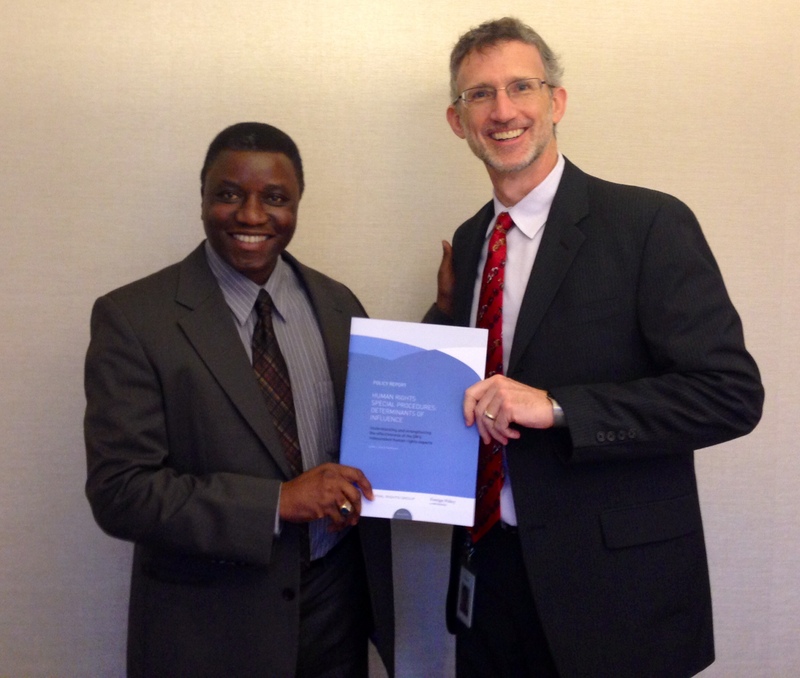 Ted Piccone from the Brookings Institution (pictured, right) today presented a copy ofthe new URG-Brookings Institution policy report on Special Procedures to the Chair of the Coordination Committee, Professor Chaloka Beyani. The policy report, entitled ‘Special Procedures: Determinants of Influence‘ analyses the emergence and the contemporary effectiveness of the UN’s system of independent human rights experts, and presents a series of key policy recommendations for strengthening the mechanisms to better face the challenges of the 21st century. A number of the recommendations are directed at the Special Procedure Coordination Committee which is chaired by Professor Beyani, the current Special Rapporteur on the human rights of internally displaced persons (IDPs). The presentation to the Chair of the Coordination Committee comes after the policy report was officially launched last month at a meeting at the Palais des Nations in Geneva, on the sidelines of the 25th session of the Human Rights Council. The launch was attended by over a hundred senior policymakers and opinion-formers from states, NGOs and the UN. In their policy report, Ted Piccone and Marc Limon evaluate the strengths and weaknesses of the special procedure system, identify the structural determinants that drive their effectiveness, explore why past systemic reform has failed and make recommendations to relevant stakeholders to strengthen the system as it continues to grow. Click here to access the report and research documents.